Get ready, Minis! 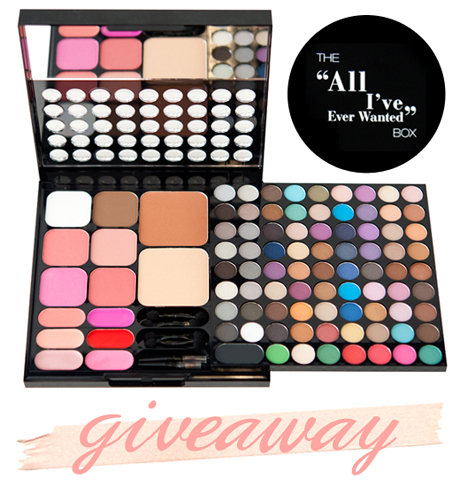 I have the loveliest little giveaway for you — behold the NYX "All I've Ever Wanted" Box. This is truly a trooper of a palette, I must say. Complete with 72 eyeshadows, 8 face colors, 6 lip colors, 4 blushers and face powders, all in a lovely black box with mirrors and applicators. The All I've Ever Wanted box retails for $28 on NYX's website (where it is currently sold out), or you can have your chance at winning here on Mini Penny! You may be wondering, well how do I enter to win? Simple! First you have to be following Mini Penny on either Google Friend Connect or Bloglovin' (I will check!). Leave a comment on this post saying anything you wish — the weather, your pet's name, whatever! — along with a contact email just in case I need to get in touch with you if you win. This is a short contest and will end Saturday, August 27th! That's right, you only have one week to enter. What are you waiting for? ▲ Blog about this giveaway. Tumblr counts, just be sure to leave me the link! ▲ Vote for me at PacSun's Dress Irresponsibly contest! For more information on this palette — including reviews, additional photos, ingredients and more — be sure to check it out NYX's website! Don't forget that my other giveaway for August, The September advertising space giveaway, is still accepting entries until September 30th. Feel free to hop over and enter for a chance to advertise your blog or shop on Mini Penny for free!